Running a commercial space often comes with high utility costs. From temperature control to lighting, it quite literally pays to make your energy systems as efficient as possible. And much of this efficiency starts with your windows. Drafty windows can spike your energy bills by 10-25%, and since commercial windows are often larger than residential windows, this can add up. Use this guide to know when it’s time to schedule commercial window replacement. How do I know when to replace my commercial windows? High Energy Bills: An increase in your energy bills, especially if they spike suddenly, is often a sign that your windows are not insulating your space. Inspect the frames for drafts to confirm the issue. Weather Damage: If there has been a recent storm or other natural disaster in your area, you might notice structural damage from branches, snow, or ice. 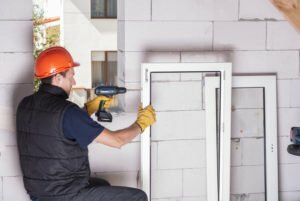 Call a professional to see if commercial window repair or replacement is best. Wear And Tear: As with all other structures of your commercial building, windows wear out over time. Older windows simply don’t work as well, so consider upgrading. Water Marks: Signs of water damage on your interior and exterior walls might actually link back to your windows. If there are cracks in the frame, water may be leaking in and spreading. Once you decide to hire a window company for a replacement job, it’s important to consider the quality of the windows you choose. Your business’s windows are an investment, so you want to select a reputable model. Talk to your window professional about which windows are most energy efficient. Even if they are more expensive, they will likely last longer and seal your space better. By thinking about the future, you can make a responsible decision for your business. Remember that choosing the right windows starts with choosing the right window professional. When installing both commercial and residential windows, it’s critical to work with the right company. By having knowledgeable window installers on your side, you can expect them to perform the job well and answer all of your aftercare questions.